Eyeshadow has individual "cakes" of color inset into the compact. 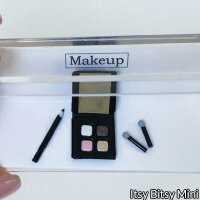 Eyeshadow compact also has a mirror. Items can removed from clear plastic display box and arranged on table, tray, etc. Eyeshadow is 5/16 x 5/16 X 3/32 inch closed (8 X 6 x 2.5 mm). Eyeliner pencil is 1/32 X 1/2 inch (1 X 12 mm). Eye shadow applicators are 1/32 X 1/4 inch (1 X 5 mm). One inch Scale.